I give it 10 out of 5 STARS! Usually when I see a film or read a book in Spanish, I tend to do my review in the Spanish language, but in this case, I will make an exception. 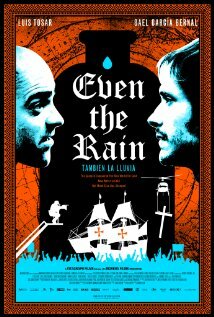 Though the film Even the Rain is in Spanish with English subtitles, I felt compelled to spread the word about the greatness of this film in English, with the intent of reaching a broader audience that will hopefully be compelled to go see it after reading this analysis. 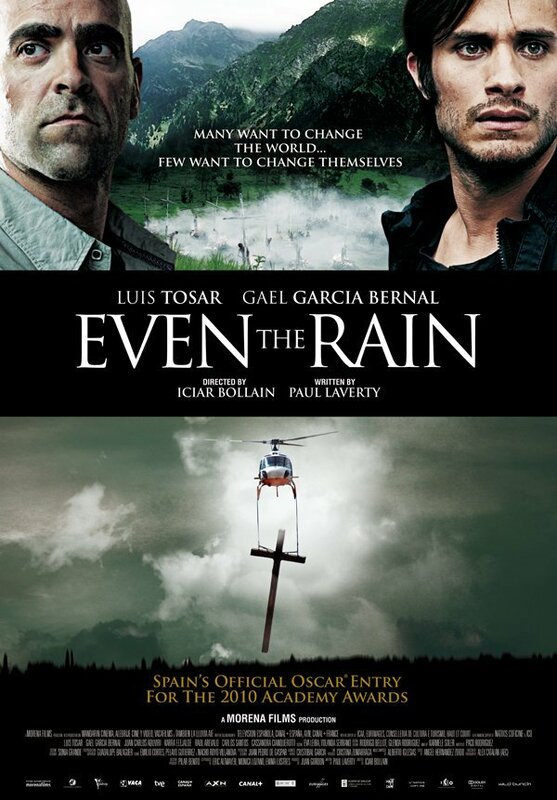 From the opening of the film to the end, it’s hard not to hold back your tears and relate to the human desperation and struggle of the native Bolivians fighting for something as essential and basic as drinking water, inspired by true events that occurred in the year 2000 in Cochabamba, Bolivia. The juxtaposition of the fictitious film scenes of the Spanish Conquest, whose thirst for gold was the cause of one of history’s most heartless and cruel genocides ever seen in the world, with the struggle of the natives to their right to water 500 years later is done brilliantly and effortlessly through a quilt of images that takes us from Spanish Conquest to the present time, and reminds us that not much has changed for some of the natives of the American continent. It’s like watching two films for the price of one, simply brilliant! The script by Paul Laverty is intense, and the cinematograhy and imaging is heart-wrenching and beautiful all at the same time. Even the Rain is an amalgamation of intense emotions with fact and fiction all delivering an unforgettable cinematography experience: exactly what a great film is supposed to be like. The Acting and the direction of the film are a rare treat, and it is no wonder that the film became critically acclaimed in Spain and was also submitted to represent Spain for Best Foreign Film at the Oscars . If you like films with substance and passion, then Even the Rain is a film that should not be missed. It’s definitely going in my DVD collection.